“God Uses An Ignorant And Unlearned Man” from Christian Faith Publishing author James Fox reminds readers that God will work through anyone who is willing to spend time with Him. The only qualification needed to do the Lord’s work is the willingness to embrace the Lord and learn who He is. “God Uses An Ignorant And Unlearned Man”: a powerful reminder that God will work through anyone who is willing to learn His face. 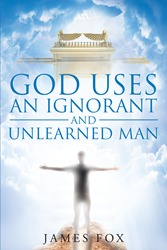 “God Uses An Ignorant And Unlearned Man” is the creation of published author, James Fox. Jim Fox and his wife, Tana, oversee Foxes of Fire Ministries and minister throughout the Midwest as well as outside of the country. They have been married for twenty-six years with one son. They currently reside in Terre Haute, Indiana. Published by Christian Faith Publishing, James Fox’s new book shares the workings of the Lord through an ignorant and unlearned man. “God Uses An Ignorant And Unlearned Man” is the story of a man who has no theological training or college education of any kind. He has made many mistakes in his life. God is, however, using him in powerful ways. The Father called him ignorant and unlearned, but reminded him that others said similar things about the apostles. Their only true qualification was their time spent with Jesus. By spending time with his Savior through prayer, fasting, repentance, and forgiveness, by studying the Word of God, this man came to be used by the Heavenly Father. Father will use anyone, ignorant or not, when they spend time getting to know Him. View a synopsis of “God Uses An Ignorant And Unlearned Man” on YouTube. Consumers can purchase “God Uses An Ignorant And Unlearned Man” at traditional brick & mortar bookstores, or online at Amazon.com, Apple iTunes store, Kobo or Barnes and Noble. For additional information or inquiries about “God Uses An Ignorant And Unlearned Man,” contact the Christian Faith Publishing media department at 866-554-0919.